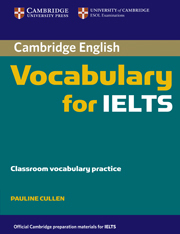 Cambridge Vocabulary for IELTS includes useful tips on how to approach IELTS exam tasks and covers especially tricky areas such as the language needed to describe data and processes. 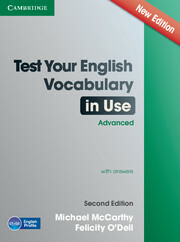 It is informed by the Cambridge International Corpus and the Cambridge Learner Corpus to ensure that the vocabulary is presented in genuine contexts and includes real learner errors. Also available is Cambridge Vocabulary for Advanced (Band 6.5 or above).